Chemical sensors are molecular constructs (receptors) that are sensitive to small molecules or metal ions (analytes) giving a measurable change in their molecular properties. The most commonly used properties are electrochemical, absorbance, emission and very recently nuclear magnetic resonances (NMR). Fluorine-19 is an excellent nuclide to produce high-intensity, well-resolved signals in NMR because the chemical shifts range between +250 and -300 ppm and the resonances are very sharp, which minimizes signal overlap. Figure 2 illustrates the quantification of the caffeine level in Starbucks coffee using the NMReady without pre-treatment. Coffee (300 μL) was mixed with a mixture of palladium complex and 4-nitrobenzotrifluoride (internal standard) in CD3OD (300 μL). 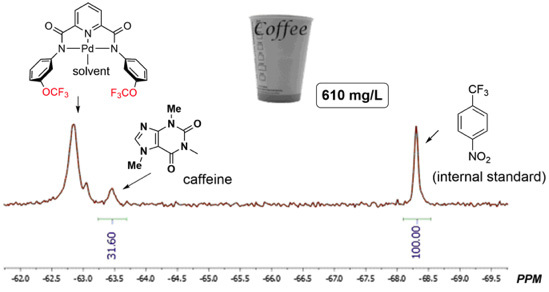 Upon complexation with caffeine, a characteristic 19F NMR signal at −63.5 ppm was produced and assigned as the palladium complex bound with caffeine. The big resonance at −62.7 ppm corresponds to the excess complex 1 added to the mixture. The NMReady gives a caffeine concentration of 610 mg/L, which is the same that was obtained with a 400 MHz high-field NMR spectrometer! If you want to know more about this cool experiment or if you want to implement it in your undergrad lab download our applications note here. Oder, T. "How coffee changed the world". Mother Nature Network 2015 Retrieved February 28, 2017. Poole, R.; Kennedy, O.J. ; Roderick, P.; Fallowfield, J. A.; Hayes, P. C.; Parkes, J. "Coffee consumption and health: umbrella review of meta-analyses of multiple health outcomes" 2017 BMJ. 359: j5024. Zhao, Y.; Chen, L.; Swager, T. M. Simultaneous Identification of Neutral and Anionic Species in Complex Mixtures without Separation. Angew. Chem. Int. Ed. 2016, 55, 917.